Amongst movie greats there are giants. Rising above these giants are legends. Akira Kurosawa is a movie god among such legends. He and the likes of John Ford and David Lean comprise the three major deities of the modern movie pantheon. No movie, since 1970, has been made without their influence. They are the Jedi of modern cinema and Kurosawa is their Skywalker. High and Low is Kurosawa's 23rd movie as a director and his 4th since leaving Toho studios to form his own production company. 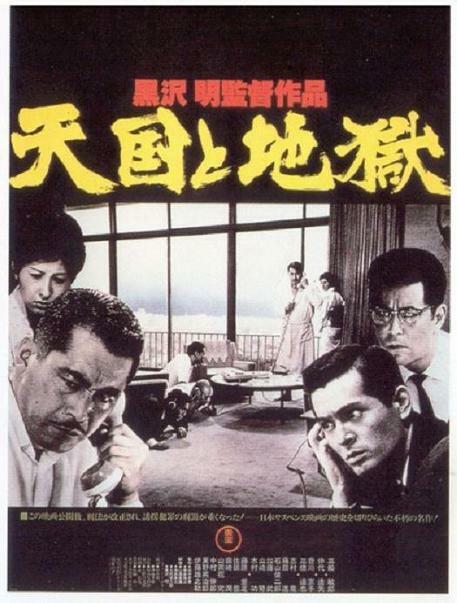 The film begins with shoe executive Kingo Gondo (played by Toshiro Mifune) in a heated debate with his fellow executives at National Shoes over the future direction of the company. They want to make shoes that cost pennies to make, but Gondo-san wants to make shoes his way: more expensive to produce but durable and more profitable in the long run. It's no coincidence, then, that Kurosawa had had enough of corporate "yes" men cheapening his beloved Japanese cinema for mass consumption at the time. His first movie after leaving Toho was The Bad Sleep Well in which a young man (played by the redoubtable Toshiro Mifune) infiltrates a corrupt corporation to seek vengeance for the death of his father. Gondo's fellow executives want him to throw in his share of the company holdings with them and usurp the company from under the founder, referred to as "The Old Man". Like an ambitious but honor-bound daimyo he rejects their offer, thereby insulting them, and has them thrown out of his spacious home before revealing his ultimate scheme to buy out the company in his own way. This is the Sengoku Jidai being played out before our very eyes! That time period in Japanese history was rife with betrayal and wolf-like vassals feeding on their weaker peers and superiors. It has the marks of Throne of Blood written all over it. The similarities end there, however, as the movie begins in earnest when Gondo receives a mysterious phone call claiming that his son has been kidnapped. The movie is clearly divided into two parts: 1) the recovery of the kidnapped child due mostly to Gondo's efforts and 2) the discovery and apprehension of the kidnapper. The first part takes place entirely in Gondo's expensive house overlooking Yokohama. What would have been a staid sequence is otherwise captured with taught dramatic effect by Kurosawa's masterful editing (he had an editor but always insisted on "helping" to cut his own films) and full use of the 2.35:1 aspect ratio frame. I have to mention one scene in particular: Gondo has ruined himself by doing the morally correct thing and so the police must save face by saving the child or Gondo's noble sacrifice will be in vain. They're sitting in his living room scratching their collective heads on how to implant tracking devices into handbags that the kidnapper will be receiving when Gondo walks in with his tools and sits himself down on the floor and goes to work on the bags like a maven. His wife and chauffeur stand there, not knowing what to say, and the cops who were originally sitting down on his couch stand up in reverent awe, totally speechless. The effect is of a man plunging headlong towards his destiny through a forest of petrified trees. Truly inspired art. The second half takes place on the seedy streets of Yokohama. We get to see the vibrant nightlife of dancers cutting loose in dance clubs as well as the decrepit underbelly of heroin fiends clawing at passersby in the dank back alleys and side streets of the city. This is where the original Japanese title fits far better than the American one: Heaven and Hell. As Gondo is praised by the Japanese public for his noble sacrifice he attains a kind of godlike status, even amongst the police officers who originally despised him for his wealth and selfishness. In fact, the police are galvanized into action as if shamed by Gondo's nobility. As the police navigate the treacherous streets of the city in pursuit of their prey they're not so much weaving in and out of an urban landscape but plodding through a maze of Hell, bedeviled by the elusiveness of the kidnapper. The two halves of the movie are nicely connected by a six-minute train sequence that serves as both transitional element and transportation for the audience. Through the means of the train we are taken from Heaven to the lower depths of Hell. Heaven and Hell collide in the final confrontation but not in any hackneyed Hollywood fashion. The antagonist doesn’t reveal all to the protagonist and we don't nod our heads (or shake them in disgust but nevertheless smug in our knowledge that he's getting his just desserts) as understanding and the triumph of reason wrap everything up into a nice warm blanket. After fading to black I sat in my seat staring at the monitor for a good ten minutes. It was jarring to say the least. This is not a movie about the triumph of good over evil or the resilience of the human spirit in the face of adversity. The cops always get their man. The real question, though, is what sort of man is he? You'll have a devil of a time figuring that one out…and you'll be enjoying every minute of it.